DETAILED INSTRUCTIONS WITH BLUEPRINT DRAWINGS. Gun Silencer Manual is a comprehensive instruction of how to make a gun silencer. The best hearing protection a shooter can get, is installing a silencer or sound suppressor on his rifle or pistol. Installed on a rifle of caliber .22 l.r. there is no sound noticeable, with this silencer design and also for airsoft guns. Usually sound increases with higher muzzle velocity, but this Gun silencer will suppress the sound amazingly well. Gun Silencers can be used on rifles up to the largest calibers. 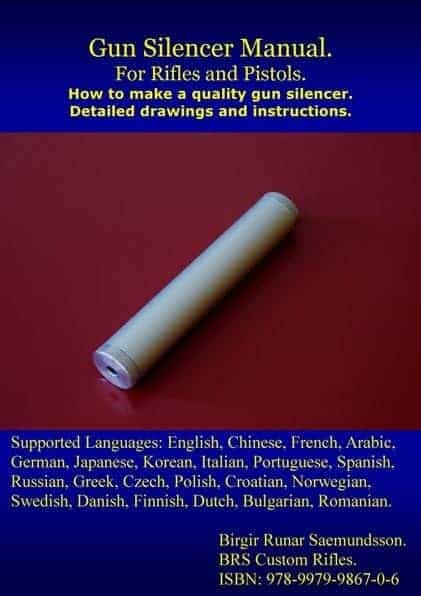 Gun Silencer Manual is an E-Book of how to make silencer, for caliber 22 up to the largest magnum rifle calibers like 458 Win Mag. Pistol calibers, from 22 up to, calibers. 9 mm, , 357 Mag, 44 Mag, and 45 ACP. Airsoft rifles and airsoft pistols, other guns of all calibers, up to the larger magnums. Complete blueprint drawings, instructions and installation information, of how to make silencer professionally. A Gun silencer, silences 22. rifle completely with subsonic ammunition. Complete instructions of how to install the suppressor to muzzle end of barrel on rifle or pistol. Silencer body measurements: Length 6 inch X Diameter 1.2 inch. YOUR BENEFITS USING A GUN SILENCER . Best Hearing Protection for rifle and pistol shooters, and hunters. Reduced Recoil, silencers reduce recoil from 30% to 60%. Flash Hiding at Muzzle End. More relaxed aiming due to reduced recoil and decrease in sound crack from shot. In the case of a missed shot, there is good chance of second shot on hunting game. This Gun Silencer is simple to dismantle, and to clean periodically. Complete Muzzle Flash Hiding . Customers can customize the size of this homemade silencer, to their needs. Customized measurement changes and further instructions are included in the Manual. This Gun Silencer design has been in use for over 40 years, with very good sound suppression. It is simple and easy to build this rifle silencer design, and install it on a rifle, much easier than you might think! This might be your first .22 silencer homemade. It is a special feeling to make your own silencer! Download digital Adobe e-Book with blueprint drawings, and installation instructions.. It is convenient for you to download and print out drawings, and instructions of how to make silencer, instead of hard/soft cover book, and have it on your workbench, or work aerial. How do silencers work ? Watch Video below Gun Silencer on a cal. 22 Rifle Test. EXCELLENT HEARING PROTECTION FOR RIFLE AND PISTOL SHOOTERS AND BY STANDERS. Adobe 128 Bit Encrypted PDF Document eBook. Download E-Book. Copyright B.R.S. Custom Rifles 2007. UNLESS YOU ARE GOING TO FIRE THE NEXT INSTANT! IF YOU CANCEL FIRING, UNLOAD GUN IMMEDIATELY .